Clare is one of Southern Counties Veterinary Specialists’ founding team members, having joined the clinic at its inception in 2008. She started as one of the surgical nurses and was later promoted to Head Surgical Nurse. Clare currently works as the centre’s Clinical Advisor, playing a vital bridging role between the clinical and administrative teams. She provides frontline communications for incoming emergencies and referral support, helping to ensure cases are dealt with efficiently and appropriately. Her extensive experience includes nursing roles in private and academic referral centres and at a Bristol referral hospital, where she gained invaluable knowledge of the fields of neurology, orthopaedics, and MRI and CT scanning. 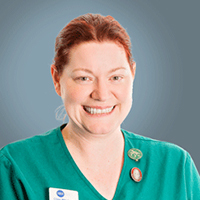 Clare began her nursing career in general small animal practice. After qualifying she travelled around Australia, working in small and large animal practices. She then acquired wide experience as a locum nurse of veterinary clinics across the UK. Clare holds nursing Certificates in Anaesthesia and Emergency & Critical Care. She is currently studying for the NCert in Medicine.